Google and Salesforce announced their partnership in November 2017 and plans for some exciting integrations between Google Analytics 360 and Salesforce Sales and Marketing Clouds. The first integration (GA 360 + Salesforce CRM) became available in January 2018 and it’s pretty fantastic. This post will highlight what is available now and what we have to look forward to throughout the first half of the year. 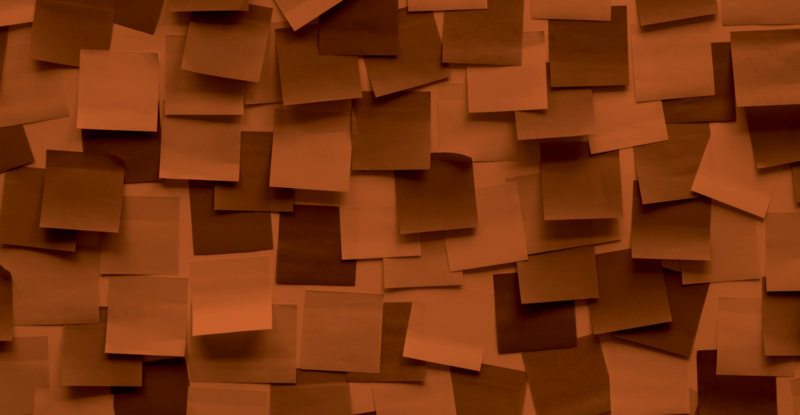 Data silos are real and something nearly every organization I’ve worked with experiences. Even the most sophisticated, who’ve invested in a powerful CRM (like Salesforce) AND an enterprise Analytics solution (like GA 360) experience them. Historically, the solution was a lift by either your Analytics team and developers or BI team to marry acquisition data stored within your Analytics platform with offline sales data. This can be done as needed for analysis, by exporting data from both systems (assuming you’re accurately storing a unique user identifier within each) to join them or by sending offline conversions into GA through the Measurement Protocol (requires development resources to create the script, validate, and maintain). While both approaches can effectively produce a single dataset for customer journey analysis and attribution insights, from awareness to customer acquisition or sale, they also require significant resource from your team to maintain and do not offer a fraction of the opportunities the GA 360 + Salesforce Integration brings to the table. 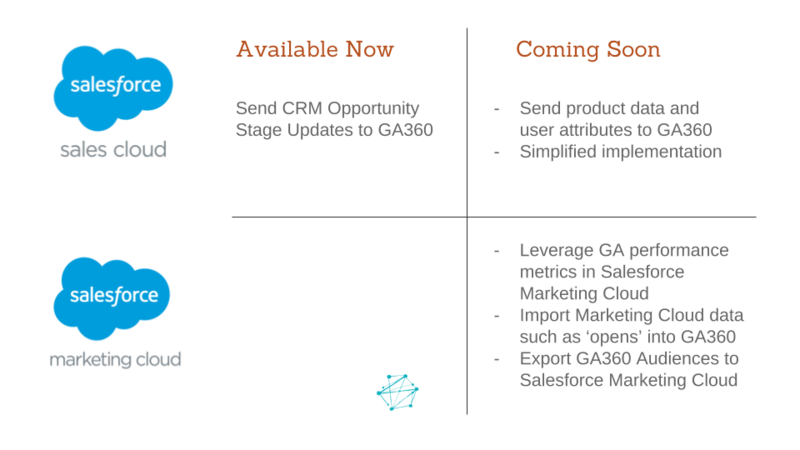 So what are the benefits of the GA 360 + Salesforce Integration? The first release drastically simplifies setup required to marry your digital analytics and offline conversion data. Rather than asking your BI team to undertake the data joining and analysis or deploying development resources to execute, you, as a marketer, can complete the configuration within the GA 360 interface. Offline conversions such as lead ‘Qualified’ and customer ‘Closed Won’ are automatically imported into GA 360 daily or even on the hour as leads progress through your sales cycle and opportunity stages are updated within Salesforce. Report on your marketing activity in terms of what is driving actual revenue (sales), vs. leads. This will simplify your job to allocate marketing spend, base it on actual ROI! Optimize your paid search campaigns in AdWords or DoubleClick Search for actual sales. GA goals for Salesforce conversions can be imported into both platforms just like lead or other onsite goals. Expand your reach for qualified users through display ads by creating audiences for qualified leads/sales in GA 360 and leveraging lookalike audiences in AdWords or DoubleClick Bid Manager. See the full customer journey from awareness through to sale and even retention. GA Custom Funnels can be created and segments applied to identify areas of drop off and opportunities for optimization by channel, campaign or other custom segments. Deliver personalized onsite experiences to users through Optimize 360 based on their stage in your conversion funnel, from awareness (have not yet submitted a lead form) to qualified lead. This would require you also have an Optimize 360 account. Interested? We can help! On top of Salesforce opportunity stages (e.g. lead ‘Qualified’ and customer ‘Closed Won’), marketers can look forward to accessing product specific data for individual customers within GA 360. With product specific data, marketers can also strengthen analysis using GA 360 features such as the Custom Funnel, layering product specific segments to understand drop off from your conversion funnel at product level. For companies who wish to cross-sell or up-sell their current customers relevant products, doing this through paid search will be easier than ever by creating desired audiences in GA 360 and pushing them to Google advertising platforms, as well as other platforms as part of the 360 product suite (think: Data Studio, Optimize, among others). See Salesforce engagement metrics such as email sends, opens and clicks in GA 360. Import audiences created in GA 360 to target through direct marketing – email and SMS – managed from the Salesforce marketing cloud. Individual website visitors are assigned a unique identifier by Google. It stores all information about how they got to your site and what they did there. Prospect submits a lead form and unique GA identifier is passed to Salesforce CRM. As prospects advance through your sales funnel, opportunity stage is updated in your CRM. GA360 checks for updates and imports selected data such as Deal ‘Closed Won’. Offline sales stage is available in GA360 with near real time accuracy for closed loop attribution, audience creation and optimization for sales. Google has shared plans for a future release of the GA 360 + Salesforce CRM integration as well as integration capabilities coming soon with the Salesforce Marketing Cloud. One of the most important elements of your strategy should be leveraging data to reach the right people when it matters most. 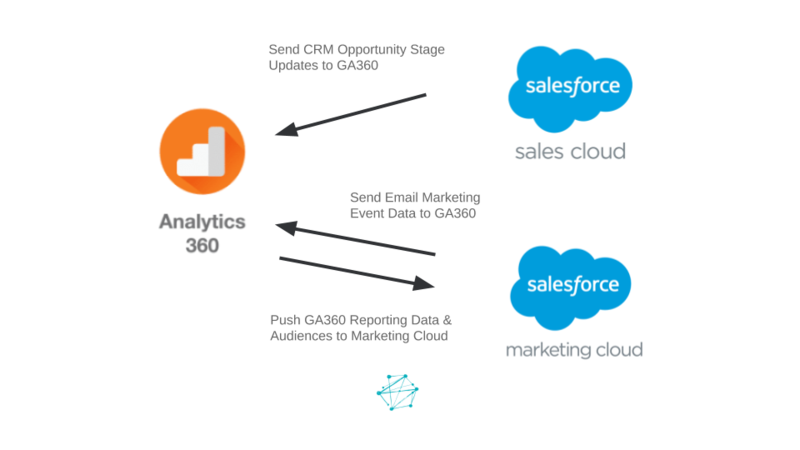 With the GA360 and Salesforce integration, accessing meaningful data about your customers’ end to end journey will allow you to optimize your marketing campaigns for sales and directly impact your bottom line. I know, exciting stuff, right? We’d love to hear how you are already leveraging the integration or questions you may have on how to get started. Feel free to drop your company’s info in the form below!